The much awaited 2018 Mercedes-Benz AMG GT-R made its first public appearance last weekend, at Goodwood Festival of Speed 2016. Its sibling Mercedes-AMG GT S which was awarded as the Best Driver’s Car last year is claimed as “the best sports car Mercedes have ever built.” Now, the all new AMG GT-R which was launched by the Auto Nation Group Inc. at Mercedes-Benz Greenhill showroom is expected to reach U.S. dealers by mid-2017. Mercedes GT-R was earlier showcased in the month of November 2015 and its global debt in 2016 was also informed at the time. This comfortable is mostly inspired by the Mercedes Motor sports car, GT-3 class racing. GT-R resembles the Nissan Godzilla. So, now let’s go in to the features of the GT-R. “Beast of the Green Hell,” it was developed on the Nurburgring. 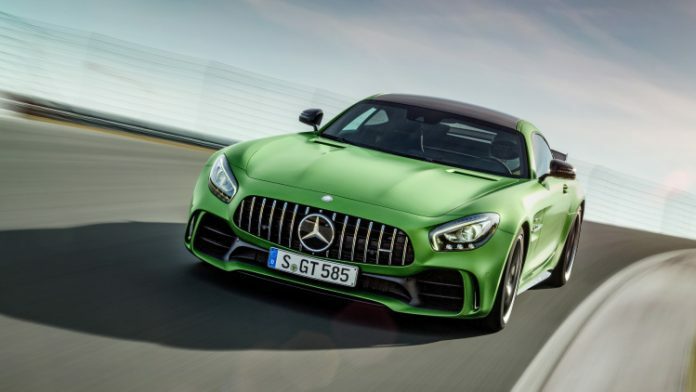 Mercedes AMG GT-R at the launch event exhibited “AMG Green Hell Mango,” shade which attracted the auto lovers. Well, this supercar boasts a twin-turbo 4.0-liter V-8 that produces 577 horse power and 516 lb-ft of torque. And the car is expected to bag 60 mph in 3.5 seconds, while its top speed is rated at 198 mph. The front fenders of the AMG GT-R are made of carbon fiber and 1.8 inches wider than the GT-S. And the rear fenders are 2.2 inches aluminium extensions, while Michelin Pilot Sport Cup 2 tires cover the standard 19-inch front wheels and 20-inch rear wheels. Mercedes says that the power is sent to the rear wheels through a seven-speed automatic transaxle. Tesla Model S Does this “S”relates to Swimming? Rear wheel steering system and the chassis are upgraded. And the AMG seats are wrapped in Nappa leather. And an adaptive suspension system is also in the list along a traction control with nine programmable levels. Mercedes GT-R base is expected to retail at $112, 000 US, while the GT-S will be price tagged as $130,000.